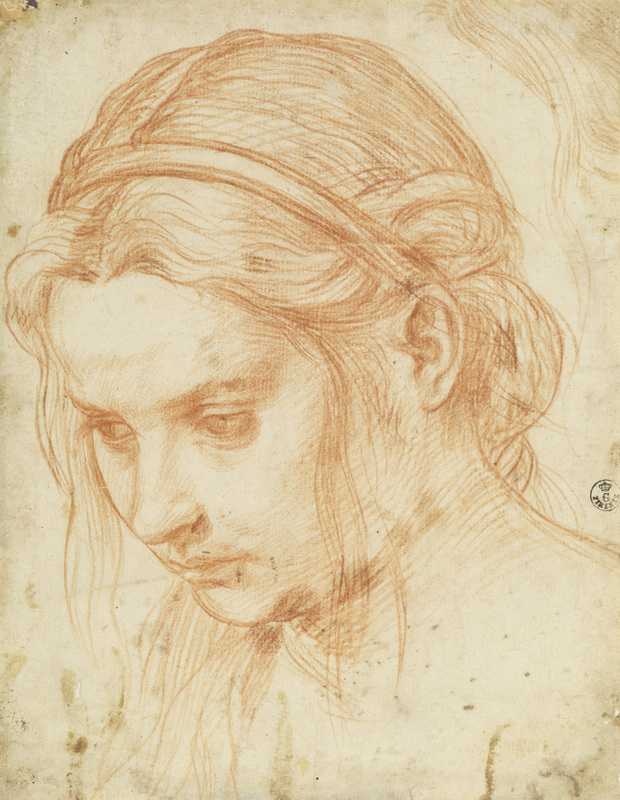 Andrea del Sarto: The Renaissance Workshop in Action | The Bottom Line "The Drawing Center"
Andrea del Sarto (1486–1530) Study of the Head of a Young Woman, ca. 1523. Red chalk, 8 9/16 x 6 11/16 inches. Galleria degli Uffizi, Gabinetto Disegni e Stampe, Florence, by permission of the Ministero dei beni e delle attività culturali e del turismo. Behind every adoring saint, serene madonna, and chubby Christ child in so many Italian Renaissance altarpieces there are surely flesh and blood people, the assistants, lovers, and children of the artist pressed into service as models. Likewise, many drawings surely stand behind each highly finished painting, as the artist captured his models in various poses and moods, seeking the best arrangement for each completed work. 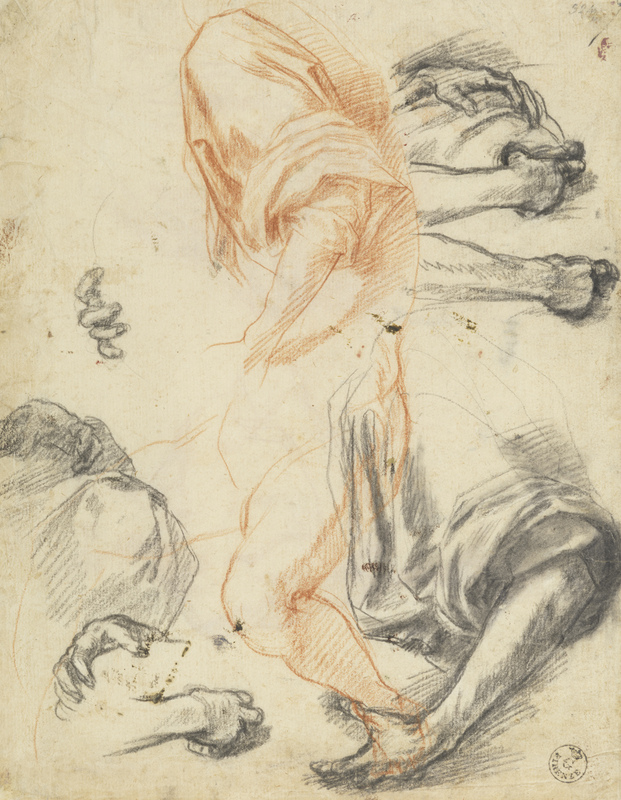 The Frick Collection’s current exhibition of works by the Renaissance master Andrea del Sarto, Andrea del Sarto: The Renaissance Workshop in Action, offers a rare chance to explore the drawn sources of this artist’s paintings. The exhibition brings together forty-six drawings, an impressive number considering that fewer than 200 drawings by the Florentine artist exist today. The works range from schematic sketches of multiple figures with faces, hands, and feet roughly blocked in, to focused studies of drapery, hands, and single figures, and luminous and detailed heads. Del Sarto is an expert in all areas, seamlessly rendering both multi-figure compositions and delicate portraits in red and black chalk. Throughout, we see him thoughtfully experimenting, working to attain the most balanced and beautiful presentation of form and style. Andrea del Sarto (1486–1530) Studies of Arms, Legs, Hands, and Drapery, ca. 1522. Red and black chalks, 10 3/16 x 7 15/16 inches. Galleria degli Uffizi, Gabinetto Disegni e Stampe, Florence, by permission of the Ministero dei beni e delle attività culturalie del turismo. An intriguing set of six drawings that Del Sarto made in preparation for the altarpiece known as The Madonna of the Steps, now at the Museo del Prado in Madrid, is particularly successful in revealing Del Sarto’s talents. Here, we can see the diversity of studies that the artist created while working through his ideas. In one drawing of a child, Del Sarto shows the plump body reaching toward an angel, effortlessly capturing the child’s rounded belly. Del Sarto’s focus here is the body, and he sketches the face in sparse detail. By contrast, in another of these six drawings, Del Sarto concentrates on the child’s expression, recording the soft play of light on his cheeks, the sweetly curved mouth, and the graceful curls of his hair. 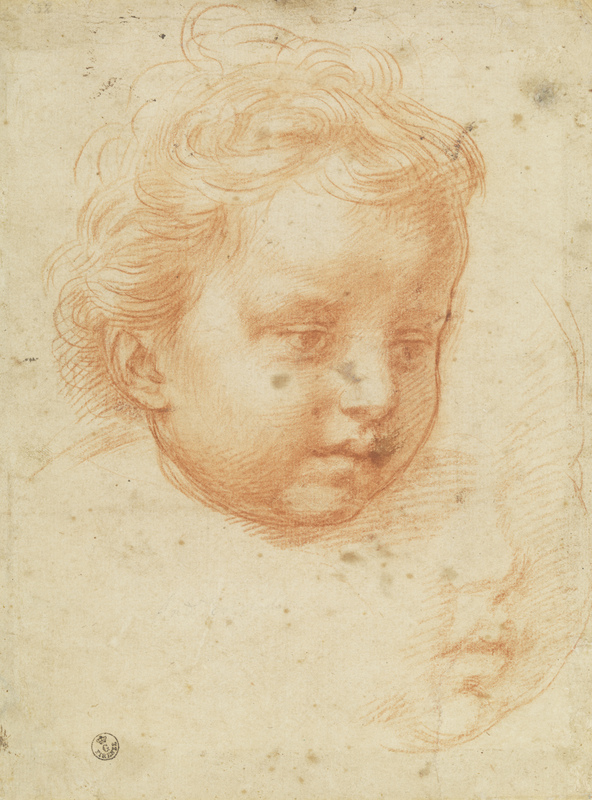 Andrea del Sarto (1486-1530) Studies of the Head of an Infant, ca. 1522. Red chalk, 9 3/4 x 7 1/4 inches. Galleria deli Uffizi, Gabinetto Diisegni e Stampe, Florence, by permission of the Ministero die been e dell attività culturali e del truismo. Another exhibition-in-miniature within Andrea del Sarto: The Renaissance Workshop in Action presents three paintings of varying genres, including the multi-figure The Medici Holy Family, a single figure of Saint John the Baptist commissioned by a private patron, and a portrait, each exhibited alongside the drawings Del Sarto made as studies. While the Museo del Prado deemed The Madonna of the Steps too fragile to travel, here the paintings on loan from the National Gallery in London and the Palazzo Pitti in Florence create a compelling dialogue between the studies and finished works. A substantiating display based on infrared reflectography applied to The Medici Holy Family reveals underdrawings Del Sarto made on the panel before applying oil paint, demonstrating yet another way in which drawing was critical to his practice. Andrea del Sarto (1486–1530) The Medici Holy Family, 1529. Oil on panel, 55 1/8 x 40 15/16 inches. Palazzo Pitti, Galleria Palatina, Florence, by permission of the Ministero dei beni e delle attività culturali e del turismo. 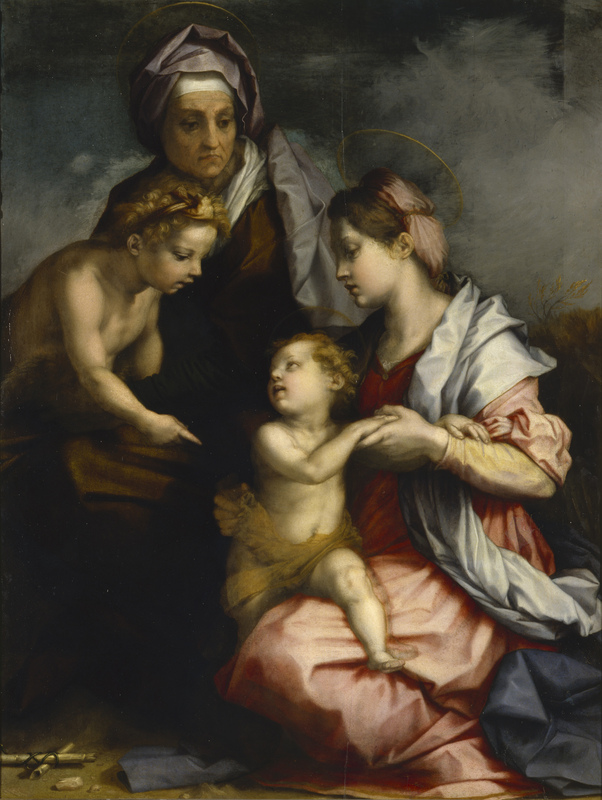 Andrea del Sarto: The Renaissance Workshop in Action is on view simultaneously with the Metropolitan Museum of Art’s Andrea del Sarto’s Borgherini Holy Family. Together, the two exhibitions form the first major overview of Del Sarto’s work in the United States. The Frick exhibition, which forefronts the crucial role of drawing in the artist’s workshop practice, is accompanied by a fully illustrated catalog, which offers an unprecedented examination of Del Sarto’s drawings and their historical contexts. The exhibition is on view through January 10th, 2016.